Every once in a while, the news gets so bad, you have to remind yourself why you're in this business. Here are a few stories I've been saving up for a bad day. Yohannes Gebregeorgis, an Ethiopian who found asylum in the United States, returned to his native land to help foster literacy programs. Lacking the money to establish a central library and regional branches, he developed a unique way to bring books to village children. Here's CNN's take. And here's a clip on youtube. 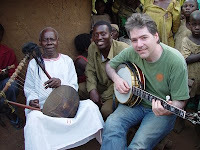 With his brother filming the journey, Béla Fleck, a young American banjo virtuoso, traveled through Uganda, Tanzania, The Gambia, and Mali to uncover the African roots of an instrument widely regarded as American hill-billy. Everywhere he went, he made friends and jammed with local musicians, many of them enormously talented artists in their own right. Here's a youtube clip that gives a good preview of the movie. And here's an account of how hard Zimbabwe University students struggle to provide themselves with an education despite their country's collapse. The campus remains a idyllic setting, with elegant modernist buildings, even as it's slowly becoming a ghost town.